The first phase of the coming assault on your privacy – is the installation of a ‘smart’ electric, gas or water meter on your home. In the case of the electric meters, it is not too much to say that they are the “gateway drug” that leads to a second even more detailed intrusion caused by the ‘smart appliances’ soon to be in stores everywhere. The appliances will be the subject of our next web page. Smart gas and water meters violate your privacy in the same way as smart electric meters, but the electric ones are the most invasive so will be addressed first. Once a ‘smart’ electrical meter is installed on your home, even before there are any smart appliances in the home, much information about your daily activities will be revealed to the utility company – and to anyone who can buy (or hack into) the data the meter generates. 1 – Above graph excerpted from Smart Metering & Privacy: Existing Law and Competing Policies, State of Colorado Public Utilities Commission. In fairness it should be noted that data as detailed as shown above could only be generated by a meter set to measure data in very small intervals – say one minute or two minute intervals. The presently announced plan of DTE is to measure this data in either 15 minute intervals or at hourly intervals. Bear in mind though, that this is only a starting point and that these meters are remotely reprogrammable – so that their measurement interval could be changed to record by the minute by sending a wireless signal to change the meter’s firmware. The utility would have the ability to selectively look at data from any home in as much detail as it wished just by fine tuning the measurement interval. As a homeowner you would have no way of knowing if this were being done to your home. When is the household asleep? When do the occupants arise and have breakfast? Is there more than one refrigerator in the house? Is there more than one stove? Is there more than one family? Is there any long period when no one is home? Are there periods when only the woman is home? Is marijuana being grown in the attic? Will there be a home cooked meal on this day? When do occupants access the internet? But, you say, the graph is labeled as to which appliance is which. 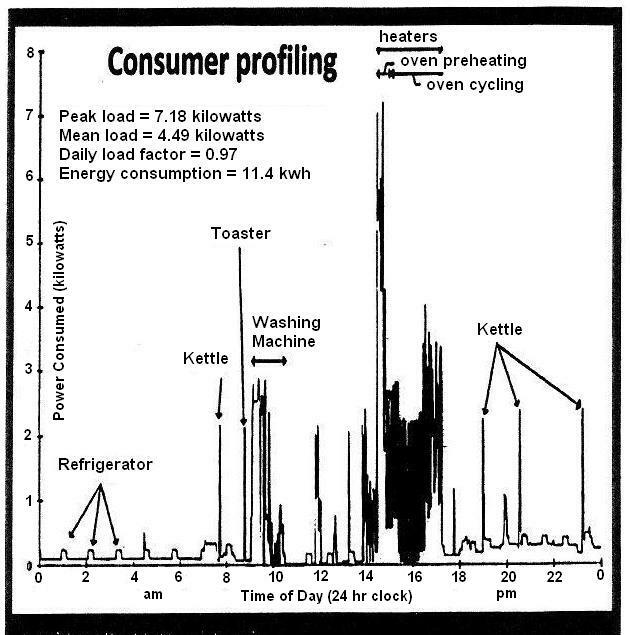 How could these appliances be identified on the unlabeled data that a smart meter would produce? The answer is that each appliance has unique characteristics in terms of the amount of current it draws, the duration of that draw, and something called the “power factor” associated with its use. The power factor of an electric motor is different than that for lighting or electric heaters. Thus each appliance has a kind of ‘signature’. Who would want this information? What about ‘smart’ gas and water meters? The types of information revealed are similar. When do household members take baths or showers? Is the lawn being watered on the wrong days (where there is water rationing). How often is laundry being done? Does an unusual pattern of gas or water consumption suggest the possibility you are running a business out of your home? Would an unusual pattern provide ‘probable cause’ for a police search of your home? All of the above is only the beginning. The next phase is detailed on our next web page. OK now that the election is over and Mr. Trump is planning to revoke all “Illegal” executive orders, what is the executive order Obama signed to order the deployment of Smart Meters? Perhaps we can get a country wide petition or letter to Mr. Trump to get this terrible exectuve order reversed? 1) The ‘Rio Conference’ on the environment. Then President George H.W. Bush informally committed this nation to the fight against man made “climate change”, without asking our senate to approve any treaty to that effect. Presumably he knew the Senate would not have approved such a treaty then. 2) The ‘Energy Policy Act’ of 2005, passed by Congress, contained some of the first references to smart grid that became an official feature of federal government policy. 3) The ‘Energy Independance Act’ of 2007, passed by Congress, officially committed this nation to a ‘smart grid’. It was an explicit provision in this act that utility customers be offered advanced meters on an opt-in basis. 4) The ‘Stimulus’ bill, passed in early 2009, under Obama’s leadership. Provided something like 3 billion dollars to essentially bribe the states and utilities to accelerate deployment of the smart meters that had been an optional part of the Energy Independence Act. The following year another !2 billion was added. Governors in many states began pressing their utilities to get with the program. Our own Governor Granholm setup a joint task force, including MPSC staffers and representatives of major utilities, to hold regular meetings about how best to move forward with smart grid. It was mandated that utilities must participate in these task force meetings. 5) Our MPSC begins to act like cheerleaders for smart grid but fails to officially approve the smart meters or perform any investigation into their safety. Pingback: Smart Meters, Electricity Usage, and Privacy | To Promote the Progress? You are making claims here but giving us no way to verify the authenticity of your information. A link to what you claim as the original study would be most appropriate. Where, for example, does the alleged “data logger” get its data, if not from a smart meter or substantially equivalent device. The graph we present was considered sufficient to illustrate the capabilities of current smart meters by both the Colorado study and by the 2010 report of the National Institute of Science and Technology. It would seem to provide much information to the skilled analyst by itself, without reference to any alleged questionnaires filled out by homeowners. In my opinion, this article really raises one valid point where this data could be used to expose your privacy in a dangerous manner, and that is to determine whether/when the home is vacant (or occupants are asleep). The rest of the points discussed imply that it would be easier for the companies, and as such the government to determine if you are breaking the law (abusing water rations, running a business from your home, growing drugs in your attic, etc.). I just learned about these new devices (and the controversy behind them) and I am trying to evaluate why I should hate them. So far the privacy angle doesn’t make the cut. Just wanted to note that the real reason for this ‘smart’ grid is to bail out the utility companies, especially the electric utilities as we are using less electricity since the advent of digital technology (see http://www.eia.gov/todayinenergydetail.cfm?id=6570). These utilities, with ‘smart’ meters collecting all of our data collectively will be marketable for sale in the “big data” market, to those six large corporations that own everything else so they can market to us. After all, the utilities must know that the ‘smart’ meters will blow out the rest of our appliances and we’ll have to real choices for replacements as the “new” appliances will all have Zigbe chips. Did you seriously add in a line to suggest that one might be able to determine the gender of a home’s solo occupant from these data based on the particular appliance used? I’ll infer that the opinion of the copywriter here lags behind into an era where men home alone would never dream of running the laundry machine or the oven.